ID: Typically dark purple in color, but can also be light purple or red/brown. Disk-like body with short spines. Holes on the top shaped like a 5 pedaled flower. Comments: I only occasionally find this close relative of sea urchins on sandy substrates at very shallow depths. Sand dollars typically aggregate in dense colonies and angle into the sand with more than half of their body exposed. Photo taken near Fox Island West Wall in 5 feet of water. ID: Elongated pinkish body with two "wings" and two small protrusions on the head. Comments: I rarely note the tiny sea angel. I typically only find the sea angel near the surface in open water as it flaps its wings as it drifts in the current. 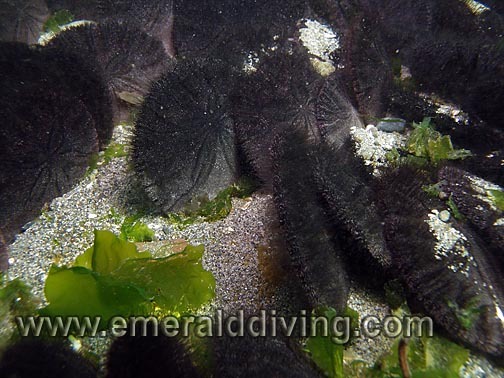 This photo was taken while snorkeling Mushroom Rock at Cape Flattery. 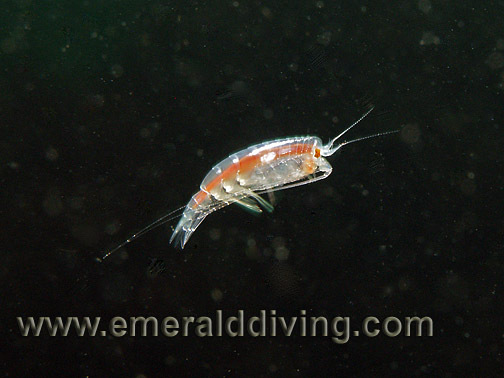 ID: Shrimp-like semi-transparent body and tail. 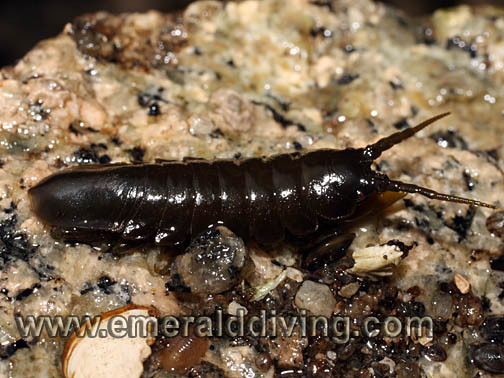 Comments: Various species amphipods are captured with this entry. I have no idea what specific species this is. I only occasionally find these tiny creatures swimming in the open over sandy substrates. Photographed at Edmonds Underwater Park. 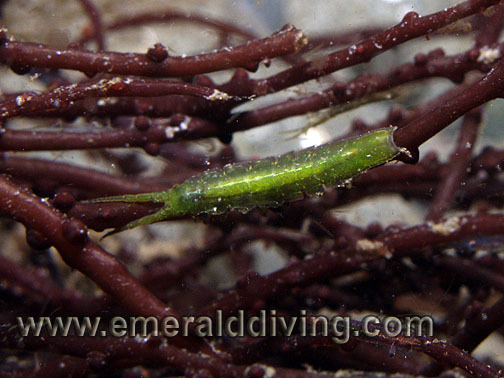 ID: Long, narrow green body with two protruding extensions from head. Comments: This isopod often attaches to eelgrass and becomes virtually invisible. Photographed at Three Tree Point in 10 feet of water. 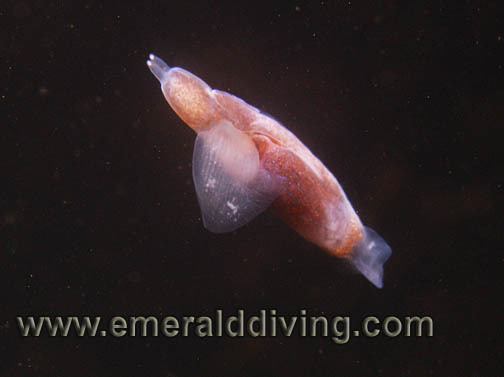 Comments: Not overly common, this sea slug is easy to identify when it is adrift in the water column and "flapping" its wings. However, it will also wrap its wings around its body when adrift, and look like a little ball. It does also settle on the bottom where it is very hard to spot. Photographed at Redondo Beach, Puget Sound. ID: White horizontal band on an orange and black striped body. Comments: I encountered colonies of the amphipod swarming a shallow reef off Effingham Island in Barkley Sound. These sea fleas apparently taste bad as advertised by their bright and obvious coloring. ID: Unmistakable spider-like frame resembling a "daddy long leg" . 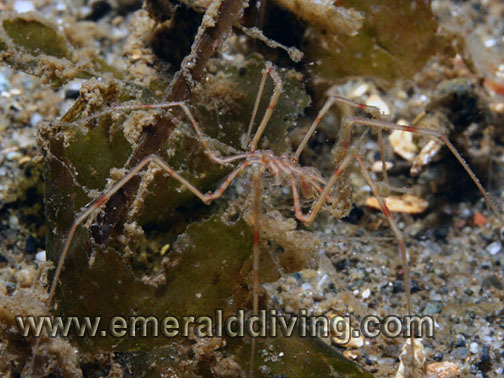 Larger than other species of sea spider. Comments: This "giant" only grows to about 1' in diameter and can be very hard to find due to its tiny frame. My best luck finding these unique creatures is below 80 feet on the soft substrate at Three Tree Point, which is where this specimen was photographed. The giant sea spider moves very slow, undoubtedly relying on its modest stature to do unnoticed. ID: Rounded tail,typically olive green color with no stripe, but color can vary. Comments: I found this little character while looking for shore crabs under rocks at low tide on the beach at God's Pocket on Hurst Island in British Columbia. ID: White, round parasite found in various species of shrimp. Comments: This candy stripe shrimp has an unwanted guest. 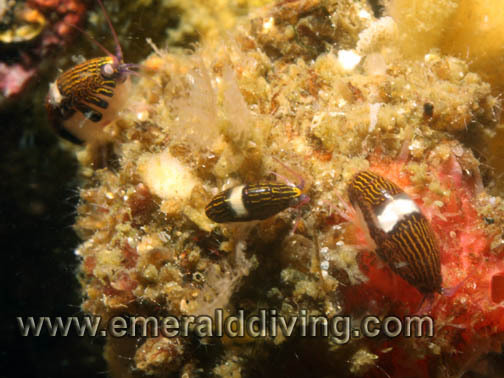 The white bulge visible in the front abdomen of the candy stripe is actually a parasitic isopod. Photographed in Browning Pass in British Columbia. 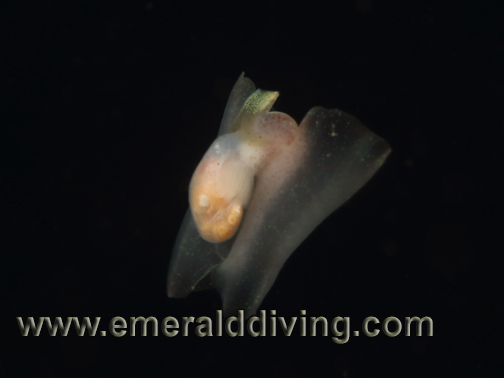 ID: Brown coloration, elongated body, found on kelp. Comments: This large specimen appears to be a female as she is clutching her brood of eggs. 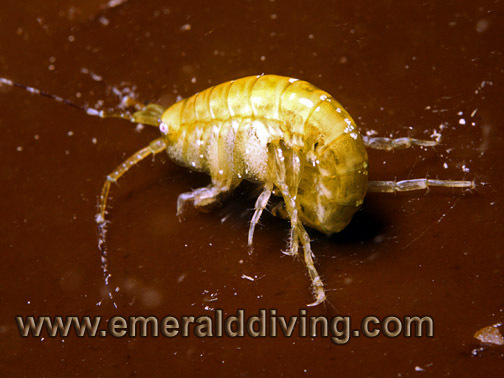 Like other amphipods, this species will carry its eggs until developed. 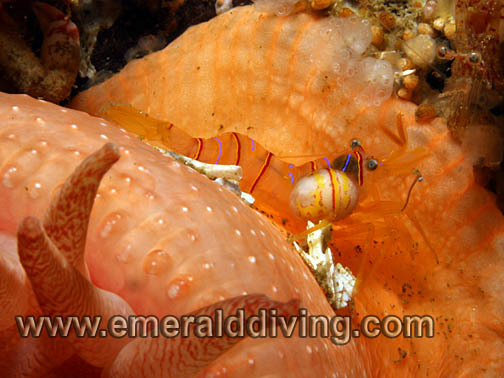 Note the rear segment of the amphipod is wrapped underneath. 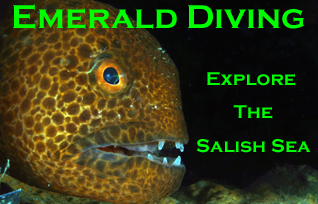 Photographed in the bull kelp off the west side of Long Island, just south of Lopez Island. ID: Thick yellow body and eight relatively short appendages. Light yellow in color. Comments: This very tiny invertebrate is very easy to miss. 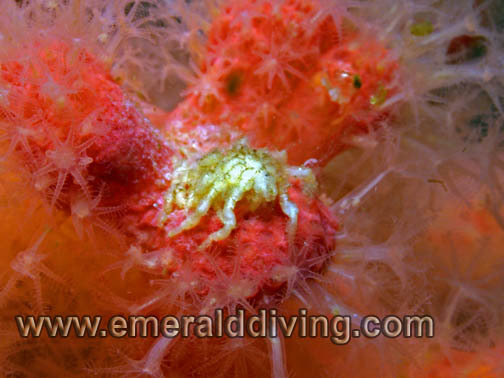 The only reason I noted this sea spider was due to the fact that it was silhouetted against brilliant strawberry anemones. Photographed at Seven Tree Island in Browning Pass, British Columbia.